As cold and flu season sets in, we see an increase in the amount of patients with sinusitis. If you have a cold that won’t go away, pain, fever or other signs that an infection might be present, here are a few things you’ll want to know. 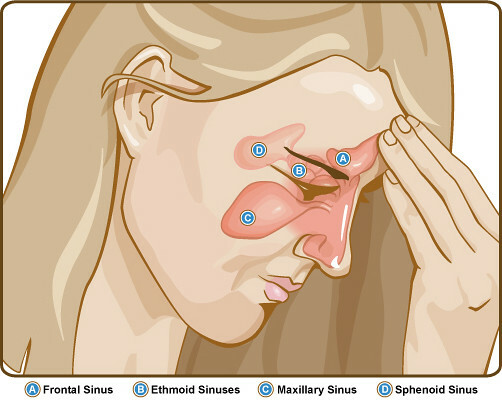 The sinuses are located behind the cheekbones, forehead and on either side of the bridge or the nose. The sinus cavities are attached to the nasal passage, which is how we breathe. Sometimes, swelling or malformation of the sinuses can cause blockage, which prevents the normal drainage of mucus, restricts blood flow and makes breathing more difficult. When this happens, bacteria can build up in the sinuses, causing sinusitis, or an infection of the sinuses, to occur. What are Symptoms of Sinusitis? The symptoms of sinusitis can vary, and often mimic the symptoms of viral infections such as the common cold or flu. Some symptoms include: sinus pressure, congestion, drainage, post nasal drip, sore throat, fever, cough, facial pain or toothaches. Sinusitis may be managed by treating symptoms, or in more serious cases, with antibiotics. Chronic sinusitis is typically an indication that there is an underlying condition, such as allergic rhinitis or a structural impairment that will be treated separately to prevent further reoccurrences.